Are you faced with a spot or stain you just don't know how to tackle? With so many different types of stains out there it's important to pre-treat and handle the stain correctly right from the beginning. Putting any 'ol spot remover on a stain could end up "setting" the stain in your carpet or fabric, making it nearly impossible to remove it completely. The stain removal chart we offer here is not guaranteed to remove your stain, but following these steps will give you the greatest chance of getting your carpet or fabric stain free. 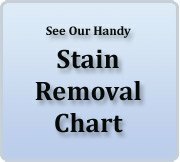 Take a look at our complete Stain Removal Chart chart to find the specific instructions for your particular stain or spot. It's a very thorough listing of just about every type of stain out there. If you feel that something should be added to the chart just drop us a line. 1. Take Action Right Away - If at all possible take action on your stain right away. The longer it sits in the carpeting or fabric the more likely it is to "set", or permanently stain the fibers. At first try to remove the majority of the stain substance with paper towel, rag, or other absorptive material. Make sure to use a blotting action as rubbing on the stain material will help it get more ground into the fibers - and harder to remove. If your stain is pastey or gooey then using a tool to help you lift it off could be in order. Possible tools to use are spoons, butter knives, spatulas, or even cardboard. We offer a handy tool for removing such material with our Power System Spotting Kit. If the material is something biological, like stomach or intestinal contents, then using a disposable tool is preferable. Once the bulk of the material is off it will be much easier to deal with the stain that remains. 2. Identify the Spot- If luck would have it that your stain material has been allowed to dry your next step is to first figure out what you have. Asking family members what went on could help you identify the spot, but that can sometimes lead to erroneous information. Otherwise, use your senses to try and figure out what it is. What's the general appearance? Color, odor? How about location? Does it have a texture - sticky, oily, stiff, etc.? 3. Vacuum- If you're dealing with a dry spill, like toner cartridge powder, you can vacuum up the majority of the material before applying any cleaning solution. This will greatly reduce your spot cleaning job. 4. Removal- As soon as possible remove as much of the excess solids and liquids as you can. 5. Test- It's always best to test your spot remover on an area of carpet or fabric that isn't visible. That way if you have the wrong cleaning solution the mistake will be hidden from view. Sometimes a spot cleaner will be great at removing the spot, but will also remove the dye or color within the fabric or carpeting. This is not ideal. Follow all product directions, cautions, and warnings carefully! 6. Break Stain Down- Sometimes some extra mechanical help is needed to break down the stain. Use a spotting brush to tap firmly on the area where the spotter solution is placed. This can help break up the stain and release it from the fibers. Just be careful not to use such a brush too aggressively. 7. Blot- Using a clean, white rag or washcloth to blot up the spotter solution will help you determine how effective your stain removal is going. If there's a lot of the stain that transfers to the rag then you know your spot removal procedure is working. Always remember to apply downward pressure and not a rubbing or sweeping motion. Rubbing with your cloth will just spread the stain out further. 8. Extract - Having a carpet extractor or carpet spotter is the ideal way to lift out any remaining stain and cleaning solution. These kinds of machines are incredibly efficient at injecting cleaning solution or plain water into the stained area and immediately vacuuming out the dirty solution. Please be aware that a "regular" household vacuum cleaner is NOT made to do this kind of extraction. Vacuuming anything wet into a household vacuum cleaner can ruin it. There are, however some canister type vacuum cleaners that can handle wet material, like our IPC Eagle canister vacuum. Be sure you have the right kind of vacuum. Reappearance of a stain happens occasionally a few days after stain removal. 'How could this possibly happen?' you ask. This is called wicking. When there's a small amount of stain left in the bottom fibers of a carpet they will have a tendency to travel up the fibers as the carpet dries. To help prevent wicking you need to very thoroughly extract the carpeting, sometimes going over the area several times. Then use a high volume air mover, like a carpet blower, to quickly dry the carpeting.